I'm back at work. And I've successfully showered before going to work two days in a row now. I'd rather be on my couch. For real. Sitting in an office all day that you can't really leave because your body hurts so much from using crutches is kind of like being in jail. I think... I've never actually been incarcerated. 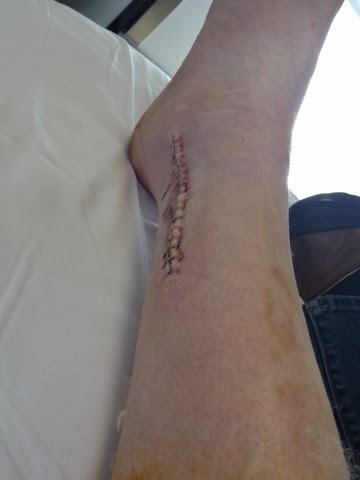 I've got some pretty gory pictures of my scar to show, so if you don't like incisions that look like Frankenstein, you'll probably want to look away. Or stop reading. 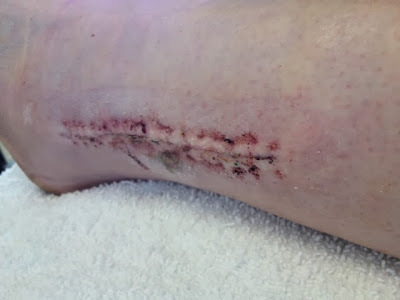 This is right after they took the half-cast off... 17 staples holding me together. A close-up of the incision right after they took the staples out. That was a bit ouchy. My new purple appendage. I get to spend the next 24 days (I've already had it 4 days) with a Barney leg. 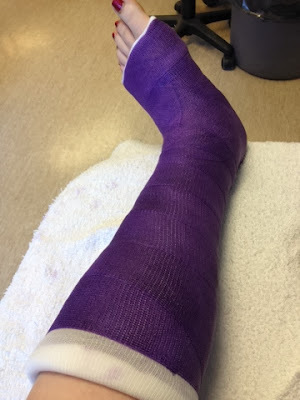 Your toes looked gorgeous in the purple cast.Did you take the cast off?Hope you feel better and dont have any pain.